I was checking out my super cool new ads from Project Wonderful today, and see that two of buttons are for Dinosaur Comics (aka qwantz.com). At that point, I was feeling pretty super cool. I love them there wacky dinos and all their house crushing adventures, so having Dinosaur Comic stuff on my site was making me feel like a big shot. I puffed my brisket and searched for a top hat, got ready to flaunt my newly found bragging rights. ..and then I looked at my referring links, and totally had an aneurysm. 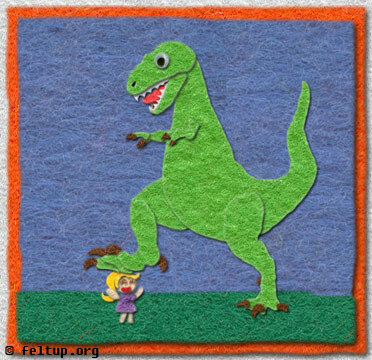 For you see, it seems a news post was made at Dinosaur Comics about Felt Up, and I'm feeling all inadequate now. My brisket..completely deflated. Please crush my with your mighty dino foot, Mr. North, as I am not worthy of stuff.